These 7 beautiful novels written by Latin American women explore the magic of story-telling; the power of food; poignant romance; heartbreak and deep joy; complex issues of identity, nationality, and gender; and intimate tales of growing up and coming home. The language is often lush and seductive, just like the countries from where these stories grew their roots. Enjoy! 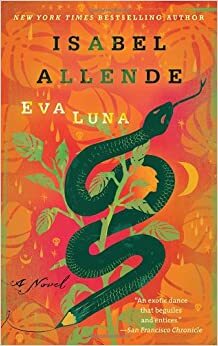 Conceived in an embrace designed to comfort a dying man, born to a servant and raised as a hired hand, Eva Luna learns quickly that she has a talent that belies her humble start: the gift of storytelling. As the years pass and her imprudent nature sends Eva from household to household—from the home of a doctor famed for mummifying the dead to a colorful whorehouse and the care of a beautiful transsexual—it is Eva’s magical imagination that keeps her alive and fuels her ardent encounters with lovers of all kinds. And as her South American homeland teeters on the brink of political chaos, and Eva’s fate is intertwined with guerrilla fighters and revolutionaries, she will find her life’s calling—and the soul mate who will envelop her in a love entirely beyond her mystical inventions. Tita is the youngest daughter of Mama Elena, the tyrannical owner of the De la Garza ranch. As the youngest, she is expected to remain single and stay at home to care for her mother. So when Tita falls in love, Mama Elena arranges for Tita's older sister to marry Tita's young man. As punishment, Tita is forced to bake the wedding cake. The bitter tears Tita weeps while stirring the batter provoke a remarkable reaction among the guests who eat the cake. It's apparent then that Tita's culinary talents are unique. Earthy, magical, and utterly charming, this tale of family life in tum-of-the-century Mexico became a best-selling phenomenon with its winning blend of poignant romance and bittersweet wit.